As of right now I’m numbering 39 boards, 467 pins, and 43 likes. Yes, I’m a bit obsessed! This is one of my favorites! The wall color is Benjamin Moore’s Chameleon. I love anything green and in this kitchen it’s just the right shade and right amount. This is such a clean, simple look with the buttery colored cabinets, the butcher block island counter top, the classic sink and faucets. I don’t need a huge kitchen, just one that is functional and well laid out! Here are those beautiful (butcher block?) 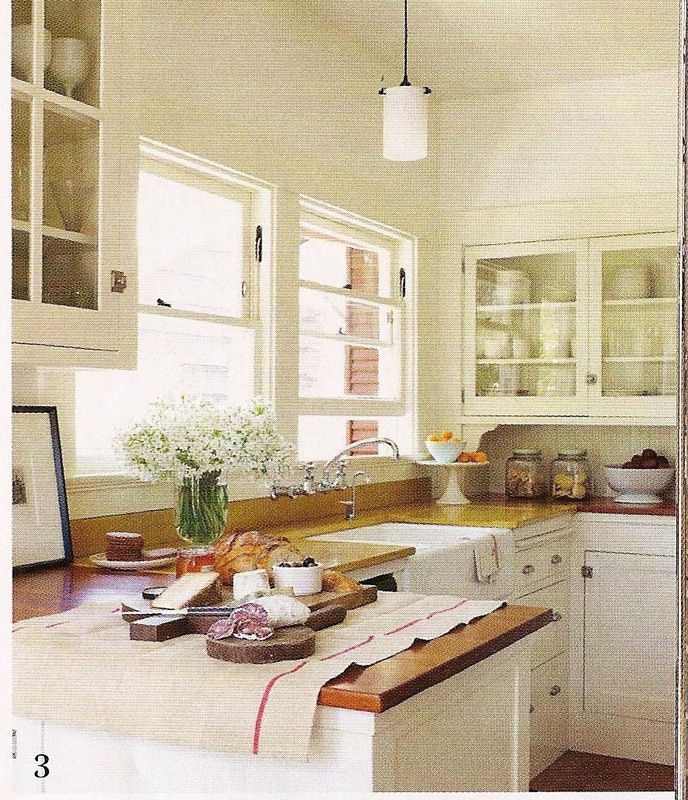 counter tops again as well as the glass-front cupboards and creamy colors. Most people probably wouldn’t choose as galley-style kitchen, I know I purposely wouldn’t! Our current house, however, is a 1970’s tri-level (yuck!) with a horrible galley kitchen (double yuck!). If I absolutely knew that we would be staying in our house forever this is something I would do with our kitchen. It’s super stream-lined and while the cabinets aren’t my favorite I do like how they add to the clean look of the whole room. Here are more views of this kitchen. On that note, I hope the weekend was all that you hoped it to be! We’ll see you in the new week! Categories: Home decor, Pinterest, Uncategorized, What I am loving | Tags: butcher block island, creamy colors, elle decor, galley kitchen, galley style kitchen, glass front, Home Improvement, Kitchen, pinterest | Permalink.